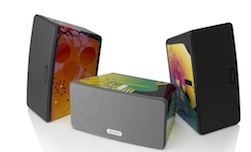 The team at streaming music service Spotify has teamed up with Sonos to give away three exclusive Sonos PLAY:3 systems designed by London-based designer Richard Robinson, best known for his forays into the worlds of fashion and music. Among Robinson’s work includes album art for Friendly Fires, Klaxons, Soulwax, Tinchy Stryder and Kate Nash.. If you’re unfamiliar with the Sonos PLAY:3 it’s an all-in-one player with three integrated speakers and three digital amps. The system is able to stream Spotify playlists wirelessly in any room to create wall-to-wall sound. The Sonos PLAY:3 application can be controlled using free apps for iPhone, iPad and Android systems and through a users PC or Mac. You can enter the Sonos PLAY:3 contest through the official Spotify Facebook contest app: HERE.